Mr. Big Food has just finished the desserts section in The Creative Cooking Course, a cookbook that weighs seven pounds. By the time he’s finished with the book, he’ll have spent nearly a year working through every page, culling every recipe deemed fit for his Big Food Manual and Survivalist Flourishing Guide. He’ll type each recipe or tidbit of information into an individual Word document. I do not believe this is the most efficient strategy– you should see the structure of the folders under the main “Recipes” folder!– but with more than 15,000 recipes, it’s too late for him to change his strategy. I’m not going to post the recipe for this beautiful dessert but please click on the photo to enlarge. Those thin threads are spun sugar. The book contains instructions for making spun sugar. Those are creampuffs, with butter rosettes defining each individual puff. Mr. Big Food was excited to show me this particular photo this morning. 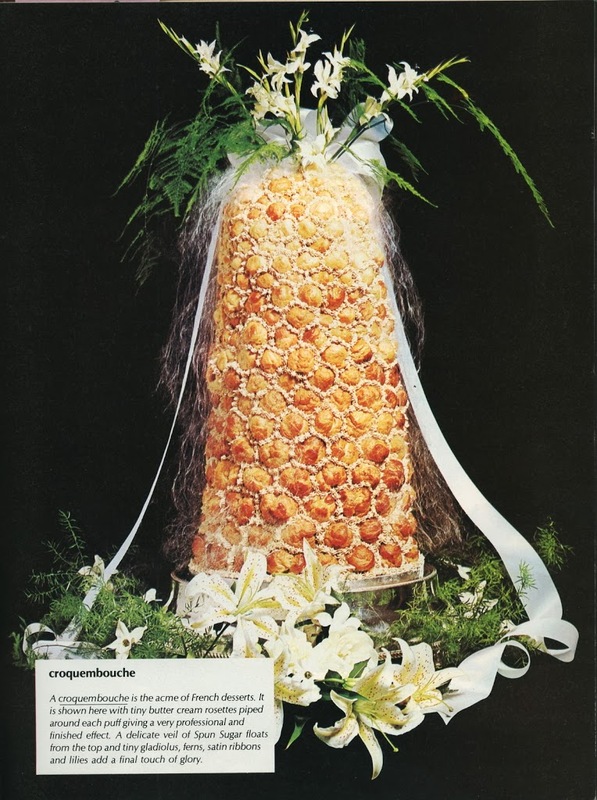 Our wedding cake was a croquembouche. 🙂 We then skimmed through the desserts section, looking at the pictures. We are talking about some serious cooking and baking here. Does anyone these days do this sort of thing– in their own home? To me, 1982 doesn’t seem that long ago, and yet looking at those pictures of steamed puddings, fondant trimmings, and Christmas frozen custard cake, it seems worlds away.